Manufacturer: Cameron Car Company, Beverly, Massachusetts - U.S.A.
- Cameron Car Company is remembered for their air-cooled vehicles and for relocating often. - At first at Rhode Island from 1902 to 1906, then in Brockton, Massachusetts from 1906 to 1908, then in Beverly, Massachusetts from 1909 to 1915, Norwalk, Connecticut in 1919, and finally in Stamford, Connecticut in 1920. - Like many people in the exciting early days of the automobile industry, James E. Brown of the Brown Textile Machine Company in Pawtucket, Rhode Island, decided to go into the automobile manufacturing business in 1901. Everett S. Cameron was hired to designed the new vehicle. 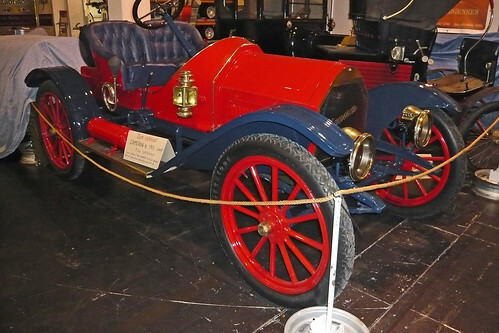 Experiments were conducted, improvements were made, and in 1903, Cameron automobile production began. 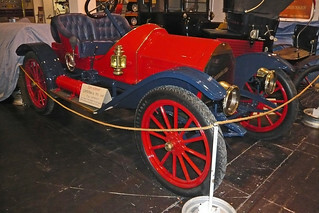 - No cars were produced from 1915 to 1918 (the company entered bankruptcy). - During their career, they would produce trucks, tractors, marine, and aviation engines as well as cars and boats. - The Runabout is probably designed by one of its founders, Everett S. Cameron. - It has a three-speed manual gearbox, one carburetor and rear wheel drive (shaft driven). - They had several innovate creations that would become industry standards, such as left-side (ight-hand drive was the accepted practice) steering wheels (wheel steering i.s.o. a tiller), front-mounted engines, air cooling, a revolutionary rear-mounted gearbox, the gear shift was mounted on the steering column and torque tube drive. - With a lack of patent applications in the early days of production (as was the case with many manufacturers), it is unclear "who was first". - Several Cameron's were used in competition, including hill climbs and dirt track events. One example even captured a half-mile world record in Cincinnati, Ohio. Another example became the first air-cooled car to reach the top of Mount Washington without requiring a stop.